The fourth in a series of community meetings regarding a new recycling initiative in Gallup was held at Jefferson Elementary April 29. Thomas D. Parker, PE, BCEE with CDM Smith presented options for a single stream curb side collection system that would reduce the amount of waste taken to the landfill by 2000 tons every year. When asked if there were any concerns about the proposal Parker said there is a small cost that will be passed on to all Gallup residents. That cost will be between $2.80 and $3.40 per month. Though it may seem like a small amount for the benefit, there are those who are living on fixed incomes and are concerned about the increase. City Councilor, Yogash Kumar, explained many seniors are not taking advantage of the senior rate for waste disposal. The reduced rate more than pays for the recycling fees and is easily obtainable by contacting utilities department. The process to implement a recycling program will be as follows: June – the Sustainability Board will decide whether to recommend the use of the recycling program. If they recommend it, the City Council could consider the prospect in July. If the council votes for implementation, the bids will go out to buy containers. Containers will be distributed and pick up will begin. It is conceivable that Gallup could have curb side recycling within the next 6 months to 1 year. After implementing residential recycling, Parker hopes the city will consider adding commercial recycling. Kumar is hopeful that recycling will take the burden off the local transfer facility in Thoreau. Elizabeth Barriga, the city’s water conservation coordinator, told the group they can “Call 863-1200 with any questions or problems regarding water, sewer or electric issues” and their concern will be recorded and forwarded to the proper department for action. He explained further that he has a full staff of officers slated until August when some recruits will leave for police academy. 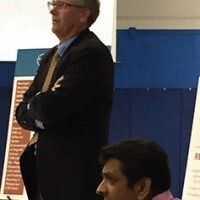 Stanley Henderson, executive director of Gallup Public Works, answered questions regarding traffic control. The residents expressed concerns about the speed of traffic and the safety of their children. 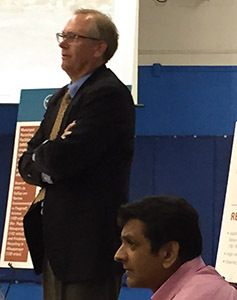 Kumar and Henderson discussed the possibility of implementing some speed bumps in the neighborhood. Kumar explained the city has made an effort to create speed bumps that are consistent with the posted speed limit thereby limiting the damage to vehicles that are traveling at the proper speed. Henderson also explained the plan for revamping Boardman Drive. “Nobody pays any attention to that speed limit either.” Said Henderson regarding the traffic on Boardman near Miyamura High School and JFK Middle School. The state has designed the project to narrow Boardman to 2 lanes, thereby controlling speed with increased congestion. The project is a result of a Roadway Safety Audit conducted by the state and is 30 percent designed. The State will hold public meetings when the design phase reaches 60 percent completion and if not derailed, the project will begin next year.